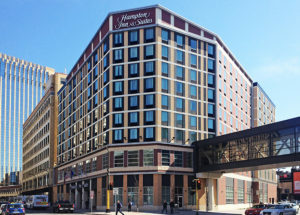 This nine-story select-service hotel provides 211 guest rooms, including 64 suites, to the Minneapolis downtown area near Target Field baseball stadium. 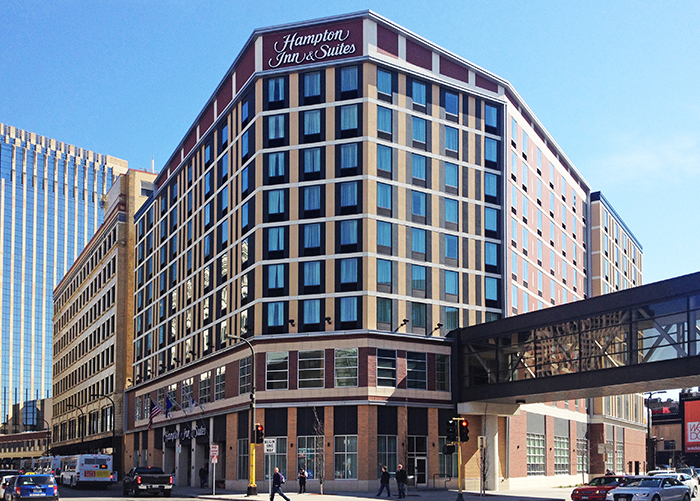 Amenities include an exterior courtyard, exercise facility, and a 1250 square foot conference room. Framing from grade to the level 2 transfer podium is structural steel columns and composite structural steel floor framing. Braced frames with steel HSS member are used to brace the transfer podium for lateral loads. Framing from level 2 to roof is light gauge bearing walls and long span composite steel deck with light weight concrete. Light gauge shear walls are used to resist land transfer lateral loads to the level 2 structural steel framed podium. Foundations are 7 inch round pipe piles driven to rock with pile caps.